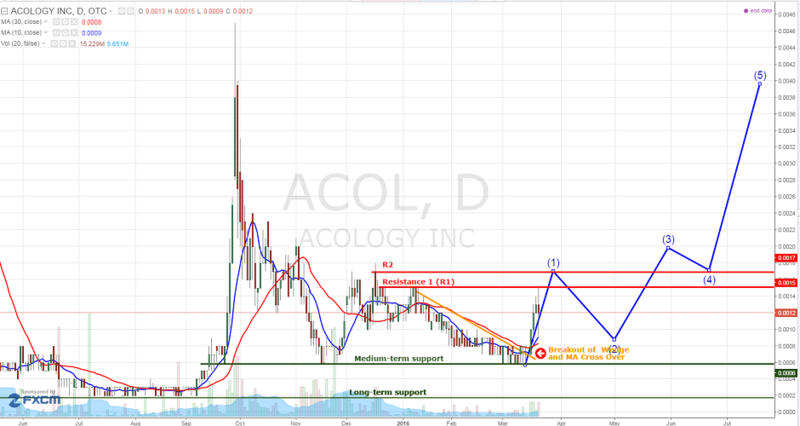 Acology Inc (OTCMKTS:ACOL) investors have reason to be excited given the surge in international sales of MedTainers. ACOL recently announced that it had sold over 30,000 units in the first two months of 2016 which represents an almost 200% increase from 2015. The Southeast Asia market is on the verge of exponential growth which will improve ACOL’s top and bottom line. The company has been focusing its strategy on an intensive marketing and sales campaign which have paid off. It focused on social media, the opening of the hospice and palliative care market in Southeast Asia and expanded global acceptance of cannabis use. Total market estimates for outside-US sales of the MedTainer 2016 are expected to exceed $4M. To continue on its growth path, ACOL announced that it finished 2015 with sales advances in excess of 310%. The company had projected that it would end calendar 2015 with $1.4M in total revenues. More details will be released and known once ACOL files it 10-K with the SEC and we can dig a little deeper to pull out the golden nuggets. The opening of the South-East Asian market is a huge growth path for ACOL. This is news that should excite its shareholder base and expand its investor base broadly. Expect to hear much more news from ACOL in the near future as its sales continue to ramp and it achieves record revenue growth. Acology Inc (OTCMKTS:ACOL) located in Fullerton, California, is engaged in designing, manufacturing, branding and selling containers that can store pharmaceuticals, herbs, teas and other solids or liquids. The company was incorporated in September 9, 1997. ACOL is currently trading at a $6 million market valuation. Fundamentally, the company is showing signs of explosive growth and is a company on the verge of breaking out. Investor enthusiasm should increase significantly over the coming weeks as ACOL announces increased growth and revenues. From a technical perspective, the chart looks to be making headways with the breakout in volume and the long base it has established over the last year. We will be updating on ACOL when more details emerge so make sure you are subscribed to Microcapspot so you know what’s going on with ACOL. Disclosure: we hold no position in ACOL either long or short at the publication of this article and we have not been compensated for this article.